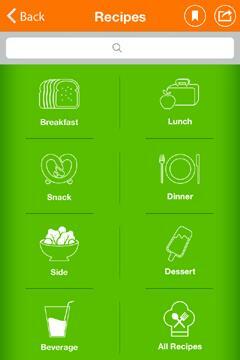 There's a new tech tool available to help kids get, and stay, fit and trim! A first-of-its-kind APP titled “Kids Making Healthy Choices," based on the award-winning, ground-breaking children's book “Making Healthy Choices--A Story to Inspire Fit, Weight-Wise Kids," seeks to motivate and empower children to get, and stay, on a healthy track while also supporting and enabling parents, teachers and other caregivers and educators with helpful resources. 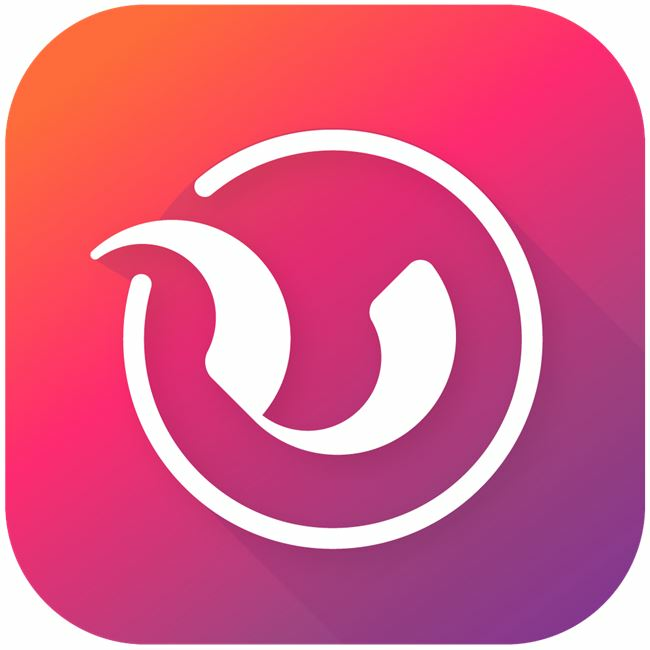 The APP, which is designed for both iPhone® and iPad®, serves to motivate all kids to make wise lifestyle choices and better understand and empathize with peers currently struggling with a weight problem, which can lessen the all-too-common incidence of bullying in schools and elsewhere. The Kids Making Healthy Choices APP, available for $2.99 on the iTunes® Store, offers an affordable and transportable alternative to the paperback book format of Making Healthy Choices—particularly since the digital APP comes bundled with both gender-specific editions plus a myriad of other value-added resources for both children and caregivers/educators. As part of the launch initiative, schools/educational institutions can receive 50% discount on volume purchasing in quantities of 20 or more. The pioneering new Kids Making Healthy Choices APP includes a bevy of valuable kids' edu-tainment and caregiver/educator support resources to inspire and inform children and adults, alike, on how to live a healthy youth lifestyle. 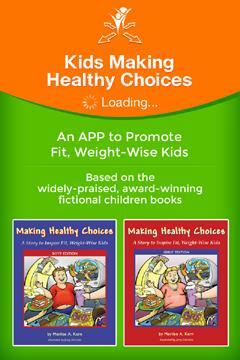 1)	Powerful Award-Winning Children's Story – This APP includes the complete digital eBook adaptation of the award-winning, illustrated children's paperback "Making Healthy Choices--A Story to Inspire Fit, Weight-Wise Kids." The APP provides both the Boys' and Girls' Edition of the lauded book to assure the story resonates with the young reader to the greatest extent possible, helping him/her identify with the main character's struggles and ultimate achievements—and motivate them to make wise lifestyle choices. In this fictional tale, which garnered acclaim from Oprah Winfrey's personal trainer Bob Greene and Sally Jessy Raphael among a litany of others, the main character changes his/her life from one of unhealthy choices and negative ramifications in the first half of the book, to one of sound choices and positive lifestyle impacts that ensue in the second half of the book. This is a story of empowerment written in a relatable tone and style that engages kids with a “voice" and perspective that resonates. The eBook contained within the new Kids Making healthy Choices APP employs a simple and uncluttered interface so users can focus on reading and absorbing the content. The eBook is also native (self-contained) within the APP, so Internet access is not required, and includes convenient tools like keyword search, “favorite" bookmarking and text highlighting. Page thumbnails make it easy for users to jump from chapter to chapter, and the user can easily navigate through pages by either swiping fingers or touching intuitive arrow buttons. 2)	Story Discussion Question Prompts - Adults are also encouraged to read this eBook, either with the youngster or separately, so they can key in on those specific scenes and scenarios that resonate with the child. 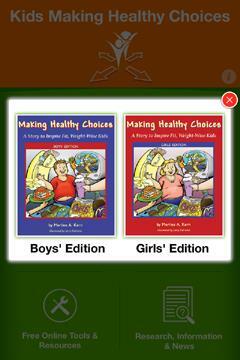 To help facilitate important discussion between caregivers/educators and children, the Kids Making Healthy Choices APP comes complete with Boy and Girl-version question prompts that directly relate to the story, offering a non-confrontational method of establishing communication on this vital subject. If a parent has yet to establish dialogue with their child regarding weight and health concerns, or is simply at their wit's end having seemingly “tried it all", this prepared, story-specific Q&A offers a non-combative opportunity for the child to express thoughts and feelings on what is often a sensitive subject. The Q&A also fosters impactful classroom discussion. 3)	Fun Activities – This APP also contains gender-specific, health-themed game and activity sheets that include a Healthy Food Crossword Puzzle, Maze, Word Scramble, Letter Shuffle and Connect the Dots, which can be exported via email in PDF format, in whole booklet form or in part so caregivers/educators may print, reproduce and allow children to utilize the fun worksheets offline. 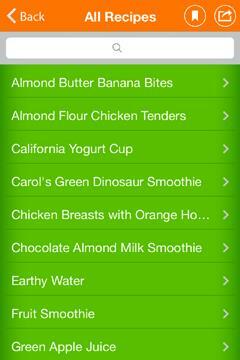 4)	Healthy Kid-Friendly Recipes – The Kids Making Healthy Choices App features a Recipes section that contains an assortment of kid-friendly food and drink items that are offered by category: breakfast, lunch, snack, dinner, side, dessert, beverage and 'all recipes.' To enhance user-friendliness, the Recipe section is alphabetized, keyword searchable, has a “favorite" bookmark feature, and notably allows users to export recipes via email in PDF format, either individually or by category, so they may print, share and utilize the material outside of the APP and/or offline. 5)	Free Online Tools and Resources – Not just an APP for children, Kids Making Healthy Choices also includes a caregiver/educator quick reference hotlink list replete with online tools that can help foster fit kids, including numerous internet calculators, online quizzes, interactive games, videos and even other useful kids' health APPs that are available. Users are enabled to export this document via email in PDF format so they may print, review and utilize the information outside of the APP and/or offline. 6)	Research, Information and News – In a further effort to streamline the provision of helpful resources for caregivers/educators, this APP also contains a separate caregiver/educator quick reference hotlink list of germane news headlines, important statistics and findings, information sources, helpful programs and more. Users are enabled to export this document via email in PDF format so they may print, review and utilize the information outside of the APP and/or offline. Future plans for the Kids Making Healthy Choices APP include the addition of a “Deals" section allowing national corporate sponsors and advertisers to offer APP users price-reduction promotion codes and printable discount coupons on goods and services that foster kids' health and wellness. “Unfortunately parents tend to be reactive to childhood obesity, dealing with the problem after it manifests, rather than proactive with a preventative mindset," notes Kern. “Many parents don't know how to communicate with children who may be dealing with weight issues. And, while shelves are filled with books that help parents manage their child's weight and related health concerns, there are decidedly few illustrated fictional story books or APPs available that directly educate and inspire children to live a healthy lifestyle. So I wanted to take that alternate approach to address the issue directly in a way kids could identify with and relate to. The added mobility and interactivity of an APP, combined with the additional resources, make this resource hugely appealing and helpful for kids and adults, alike." The Kids Making Healthy Choices APP is compatible with any iPhone® and iPad® with iOS 6.0 or greater and is available for purchase in the iTunes® Store. 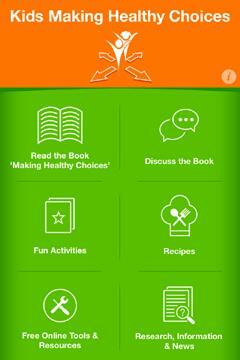 Learn more about the APP as well as the book online at www.KidsMakingHealthyChoices.com/theapp.html. Visit www.KidsMakingHealthyChoices.com/cruise.html to read a review by a second grade teacher who utilized the book for an in-class lesson on nutrition & lifestyle-based wellness. "I'm thrilled to talk about your new book - I think it's a really innovative way to reach kids...this book I think is a great way to do that." “This story's realistic and empathetic portrayal of a child struggling with weight issues, which is depicted in a non-combative tone and style, is sure to resonate with adolescents and will go a long way in motivating our nation's youth, and their parents, to make positive lifestyle changes." "I'm excited to tell others about the new APP based on your book. It's a fun and unique way to reach kids. What a great way to get kids to stay on a healthy track!" “This book is a must read for parents who want to empower their child by understanding the negative societal influences they are up against each day, and exactly how to make decisive changes to get them on track toward a lifetime of health and wellness." “Every overweight child in America would benefit by reading this inspirational book of hope, which depicts a representative overweight child who achieved his goal of living a healthier, happier life by first understanding why the problem exists and, in turn, making decisive changes." “Simple and to the point, this book provides the framework for opening up lines of communication between parents and their overweight children. It does a wonderful job of portraying an average overweight adolescent as he encounters - and ultimately triumphs over - the overwhelming amount of commercial, organizational and social stimulus that, on both a conscious and subconscious level, adversely affect his lifestyle choices. A real value for the health conscious parent! " *As with any medical issue, those concerned about the diagnosis, treatment and/or management of childhood obesity or overweight conditions are encouraged to speak to their physician. Apple, the Apple logo, iPad, and iPhone are trademarks of Apple Inc., registered in the U.S. and other countries.  App Store is a service mark of Apple Inc. iTunes is for legal or rightholder-authorized copying only. Don't steal music.